Create a grid approximately 25X25. Place all players in the grid. Instruct them to pair up with a partner 1 ball per pair. The player without the ball spreads his legs slightly wider than shoulder width apart. 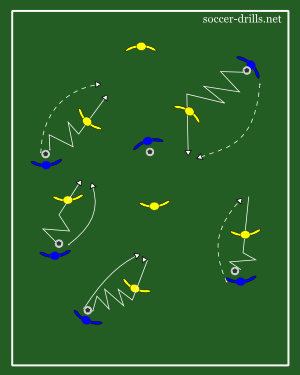 The players with the ball dribble around the grid, pass the ball through any of the resting player's legs, and collect the ball on the opposite side. Play for 1 minute and see who can pass the most balls between the legs of the resting players.